Recently, Barbara Kent held a two-day workshop entitled “Meeting the Stimulus: a Look at the Gift of Inhibition.” I signed up quickly when this event materialized on the ACAT website because opportunities to study at length with a 55-year veteran of the Alexander Technique are few and far between. And indeed it was a rich and spacious experience, with plenty of time for hands-on work, play and reflection. Alice Olsher taught the Post Graduate Program "The Carrington Games: From the Basics of Self-Care" to Training Teachers on January 14 & 15. We are so pleased to have visiting teacher Bob Britton presenting a workshop—"Tuning Direction"—and there is still space for you to join us at ACAT on Saturday May 14th at 1pm. In advance of him joining us in our space we thought we would ask him a few questions to introduce him to the community. A. I first started taking lessons in 1974, and graduated as an Alexander Technique teacher in 1978. Q. What was your first exposure to the Alexander Technique? A. I first experienced the Alexander Technique because I had a knee injury as a result of sitting intensively in Zen meditation. A friend recommended that I try taking a lesson with Frank Ottiwell after I found out that the surgery for my knee injury would be a major operation. As soon as I walked into the lesson Frank noticed that my habitual style of walking was awkward because I habitually carried my right foot pointing out to the side ever since I had broken my leg when I was 10 years old. Frank asked me to completely relax my leg and then to drop the foot to the floor. My foot came down pointing straight ahead. Frank then asked me to take a step and I put it down with the toe facing out to the side. Frank said, “You see the foot knows where it wants to go, but you think the foot should be pointing out to the side.” I was amazed that what I was doing with my foot would make a difference in my knee. Gradually after six weeks of lessons my foot gradually came back around to pointing ahead as Frank introduced me to the larger organization of my whole body. Then the knee problem basically took care of itself and healed. I was impressed! Q. What made you decide to become a teacher of this work? I was not planning on becoming an Alexander teacher while I trained. I really was training to deepen my own experience of this marvelous work. After I graduated many people started coming up to me with ailments and the Technique was quite successful in helping them out. So when I left the Zen community it was a very natural choice to pursue the way of life of being an Alexander teacher. Q. What most excites you about your upcoming workshop at ACAT? A. Teaching workshops in the Alexander Technique is always energizing and gratifying. Somehow, thanks to human evolution, when we are sharing knowledge and skills about moving with more grace and efficiency everyone has a chance to experience joy and satisfaction. This is because our nervous systems are not neutral about the experience of moving with more efficiency. If we are moving with more skill we have more of a chance of survival, and the nervous system rewards us with endorphins. Of course working with old friends and new teachers who want to learn is always is a delight. Q. What is your favorite way to engage with the AT in your daily life right now? A. My favorite way of engaging with the Technique is organizing myself dynamically upward each morning, and throughout the day, especially by allowing my ribs to move buoyantly upward and engaging with the engaging with the environment around me. Meeting life from a dynamic and energetic organization is a true pleasure. Q. What is most fascinating to you about the AT today? A. Our human vertebrate structure is very, very old, and tuning into its beauty and brilliance is constantly refreshing. In addition, I love refining and finding more depth and sophistication in Alexander’s work. Q. What is the most surprising effect your study of the AT has had on your life? A. My experience is that everything changes with our posture. When our posture is dynamic, expanded, and engaged with our environment, the freshness of being happens. This is possible in every moment. The Alexander Technique is the best thing we can do in the present moment to improve our quality of being. Q. Tell us about an interest/skill/passion of yours other than of the Alexander Technique. A. One passion I am following now is going out with my local astronomy club to observe our Universe from dark sky locations. To be peering through my telescope and suddenly see the light from a distant galaxy that left there millions of years ago and now is arriving inside of my eye, is a rather awesome experience. There are still a few spaces left in Bob's workshop. Go here to find out more and to register. In February 2016, Senior Alexander teacher Judy Stern convened a panel discussion entitled Living with MS and How Alexander Technique Can Help: A Students Perspective. The discussion centered around a student named Ron, who shared the numerous ways the Alexander Technique has been effective for coping with symptoms of Multiple Sclerosis (MS). To protect Ron’s privacy I’ll only use his first name. The National Multiple Sclerosis Society defines MS as “an unpredictable, often disabling disease of the central nervous system that disrupts the flow of information within the brain, and between the brain and body.” Ron credits the Alexander Technique with lessening the severity of his symptoms, improving his quality of life and overcoming several professional prognoses that “there is nothing you can do”. With the aid of the Technique he is still ambulatory, walking with only a cane. He also drives, plays golf and is very physically active. Ron is in his mid-70s and has been living with the disease for many years. He is a resident of the greater New York metropolitan area, is married with grown children and is a retired business executive. He has studied Alexander regularly for the last seven plus years. During the panel he spoke about how learning the Technique has transformed the way he lives with the disease. Stern gave a demonstration of working with him in walking, inviting the audience to observe visible changes in his movement patterns. One of Ron’s great concerns is his gait. A few years ago his right knee began to lock involuntarily; spasticity or involuntary muscle contraction is a major symptom of MS. This prevented him from being able to transfer his weight fully onto that leg as he walked. The demonstration showed both Ron and Stern attending to his overall coordination, taking into account the working of his whole body in walking including his head, neck and back. They examined how his whole system responded to weight transfer on to the compromised leg. With an awareness of how he was using his whole body he was able to control his knee spasticity in walking enough to execute a smooth and complete weight transfer onto that leg. Ron was able to release his hips, allowing for an easier leg swing and hence greater flexion through that joint. Conscious releasing of his neck and back muscles helped him resolve the compensatory, maladaptive patterns in his upper body that formed as a result of the knee spasticity. He uses a cane to further improve his balance and coordination but doesn’t need to use it for weight bearing. Ron discussed how Alexander Technique helps him deal with symptoms of fatigue and stress. These are extremely debilitating symptoms for people with MS. In his Alexander sessions he spends some time lying on the table, practicing constructive rest. The focus in AT on learning to release unnecessary tension often provides him a complete release of spasticity during his lesson time on the table. In addition, a lot of attention is given to releasing his ribcage and improving his breathing coordination. All of these components of the work likely lessen his fatigue and stress level. Working with his breathing in AT piqued his interest in mindful meditation, another modality that has brought him some relief from these symptoms. Ron describes how his lessons have helped him develop a keen kinaesthetic awareness of himself in movement, learning to pause thoughtfully when he becomes aware of maladaptive patterns, gaining more control over his motor coordination. He describes how it maximizes his abilities in other techniques such as yoga and strength training, both of which he does everyday and have been crucial to his health maintenance. He credits AT as helping him become more adaptable to the rigors of these techniques, able to more quickly and efficiently learn new movements, developing crucial new neural pathways. The discussion took place at The American Center for the Alexander Technique (ACAT) in New York City during their Annual General Meeting 2016. In addition to Judy Stern, four other teachers (Kim Jessor, Rebecca Tuffey, Joan Frost and myself) who’ve worked with Ron joined the conversation after the demonstration to share methodology, insights and observations. Each of us remarked on what we saw as his extraordinary progress. The event provided an important context for looking at the benefits of AT through a medical framework, offering an anecdotal example of how Alexander Technique has improved the quality of life for a patient dealing with MS and how it may, with further study, become an accepted practice for functional recovery for MS patients. This post originally appeared on Rachel's blog: rachelbernsenat.com. The Alexander Technique can help you fine-tune the things you do in your life. Instead of your daily routine making you more tired, more compressed, more achy, it can help you find ease, lightness and freedom. 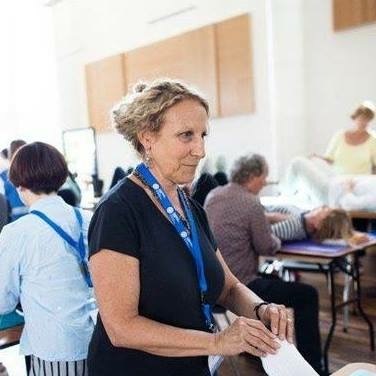 To find out more about how you can save your neck and make your back stronger and freer, come to one of our monthly free introductions to the Technique or to a drop-in group class. To find out more about how you can make your back stronger and freer, come to one of our monthly free introductions to the Technique or to a drop-in group class. A. I was certified by AmSAT and ACAT in 1991, although I have been teaching singing since the late 1970s. Q. How were you first introduced to the AT? A. I was introduced to the Technique through a friend of mine at the Longy School of Music in Cambridge, where I went in 1972 (after college) to study with the extraordinary singer, artist, and teacher, Olga Averino. My friend Susan had been studying voice since high school but had developed enormous vocal tensions. Susan's teacher at Longy (not Olga) had lived for some years in South Africa and was acquainted with the Technique and felt that Susan would benefit from lessons. There were very few AT teachers in the area at the time, but Susan started lessons with Joe Armstrong. Susan would share with me her experiences in her lessons, and she encouraged me to study with Joe by saying that she thought I would like the AT because it was "very intellectual!" Without knowing a whit about what the Technique was about, I went off for Alexander lessons. Everything in my life changed. I remember so clearly my first lesson, looking at Joe and thinking that he was standing in a very odd fashion. He clearly had a "torso back and up off the legs,"which is what we see in great athletes and musicians, but it was foreign to my eyes and foreign to my body. It was however exactly what Olga meant when she said that a singer must, "stand like a baseball player." At that time, I had little understanding of how to use my body. Indeed, the comment after my first jury in conservatory was, "Musically very intelligent but needs to develop the physical requirements necessary for solo singing." A. About six months after I started lessons with Joe Armstrong, my posture changed quite significantly, and about a year after that, I had an experience that was quite revelatory. I was in conversation with someone, and for the first time in my life, I was totally present and spontaneous. I think that experience made me understand the profound nature of the Alexander Technique, even though I was light years away from understanding it. Those early years of study were so transformative to every aspect of my life that it seemed natural to want to share this work with others. I have always loved teaching, and once I started doing more and more voice teaching, it became apparent to me that including Alexander as part of voice study would be ideal. In the late 80s, I began to shift my performing away from musical theater to more concert work, and it became easier for me to commit to the three-year training. I entered ACAT in the spring of 1988. A. The art of using one's voice in singing and acting can often seem quite mysterious. In her autobiography, "The Inner Voice: the Making of a Singer," the opera singer Renée Fleming asks: "How can I describe a process to you that is mostly unconscious?" And Olga Averino in her book, "Art and Principles of Singing," writes that "the process of good singing is a process of physical and psychological coordination. Physical coordination depends on the alignment of the singer's instrument. In itself, it produces no sound, but it creates the conditions which allow the imagination to produce the sound." As Alexander teachers we guide our singing and acting students to an improved use of their bodies and their coordination, but we must also be able to help them free their imaginations and encourage them to have a curious and improvisational mind. Only then will they truly sing or act freely and expressively. My main goal for this workshop is for participants to explore how to use their imaginations to stimulate breath and voice, and to understand and how to creatively work with many of the vocal concepts that abound in voice lessons, such as: vocal support; open throat; breath movement; diaphragmatic breathing; grounding; embodied voice, intention, etc. A. It's simply a way of being present in the world, isn't it? by Jeffrey Glazer Group classes can be a great way to learn the Alexander Technique. I recall a vivid example of one group class when I discovered the power of the mind/body connection, and realized how much my thinking was affecting my body. During this class we played a simple game. The students all stood in a circle, and the teacher introduced a soft, squishy ball to toss to each other. We were supposed to make eye contact with someone in the circle before we tossed the ball to them. As we began, I didn’t notice much. Then the teacher asked us to tune into our bodies. It was then that I noticed a tightness in my neck, that I was clenching my jaw, and more or less holding my breath in anticipation of the ball being thrown to me. The teacher then pointed out that there were no penalties for dropping the ball or making an errant throw, no winners or losers, and no time limit. In fact, we could even let the ball drop in front of us instead of catching it. That’s when something clicked. I realized I was bringing the same attitude to this game that I brought to many other areas of life. Namely, that I was supposed to be right, good, and not mess up. I assumed the goal was to catch the ball, make accurate throws, and look good doing it. I decided that the next time the ball was thrown to me, I would let it drop. But the instant the ball was thrown my way I found myself reacting and trying to catch it. It took a few times before I was able to stop reacting and let the ball drop. I had finally opened myself up to something different, a non-habitual reaction to a ball being thrown my way. Then I noticed my neck and jaw weren’t so tense anymore, and I had stopped holding my breath. The next time the ball was thrown to me I did catch it, but it was a choice rather than mandatory. The traveling of the ball through the air and into my hands seemed to happen in slow motion, and my movements were fluid and spontaneous. I realized that my thinking really did affect my body, and not just in this game, but in all walks of life. I had learned that before reacting to something, I could decide how I wanted to respond. My habitual attitude of “catch it or else!”, only created fear in my nervous system, which I reacted to by clenching my jaw, tensing my neck, and holding my breath. Once I changed my thinking to allow for a choice, I was in a state of poise, so that during the times when I decided to catch the ball, I did so with greater ease. Most importantly, the chronic pain in my neck and arms began to dissipate as I let go of the tension in my neck and jaw, and stopped holding my breath. What’s great about the Alexander Technique is that it paves the way to do something differently, with more ease and poise. Beginning this January, ACAT will be offering drop in group classes. Come for a class and experience for yourself how the Alexander Technique can help you. by Brooke Lieb Alexander Technique teacher and author Pedro de Alcantara is celebrating the release of the 2nd edition of his popular book, "Indirect Procedures: A Musician’s Guide to the Alexander Technique," with ACAT! He will be discussing how his deepening understanding of the Alexander Technique in the sixteen years since the publication of the first edition has led to a substantial revision of the book in a free event open to all on Monday, November 10th. This will be followed by a weekend workshop, "Forward & Up: A Creative Approach: An experiential workshop for Musicians, Alexander Students and Alexander Teachers" on November 15th and 16th. When did you first experience the Alexander Technique, and why did you decide to have private lessons? I went to college at SUNY Purchase in Westchester. One of my cello teachers took lessons from Pearl Ausubel and suggested that I try the Alexander Technique to improve my coordination at the cello. I went along with his suggestion, not knowing what I was getting into! What are some of your stand out memories from those initial private lessons? Pearl was my first teacher, and I took infrequent but regular lessons from her for about two years. My memories of my very first lesson, in the fall of 1978, was the feeling of growing, growing, growing like a plant in a speeded-up stop-motion video clip. It was absolutely intoxicating. Why did you decide to train; and how did you choose which course to join? Lessons were having a deep effect, and I decided to see what would happen if I brought the Technique to the very center of my life. I trained with Patrick Macdonald and Shoshana Kaminitz in London, from 1983 to 1986. My motivation was partly to train with someone who had trained with Alexander himself, and partly to study the cello with a great London-based teacher, the late William Pleeth. What was your inspiration for Indirect Procedures? In the spring of 1990 I visited the pianist and composer Joan Panetti, one of my old music teachers at Yale (where I went after my undergrad studies at SUNY). She witnessed me in a somewhat directionless personal and professional transition, and she suggested that I write a book as a way forward. I’m of course very thankful for her insight regarding the merits of writing a book and my potentialities as a writer. Tell us about the revised edition. The first edition was published in 1997, but some of its concepts were borne of a research project I did while training back in 1985 and 1986. This is almost 30 years ago! Naturally enough I learned many things over the decades, and the old edition didn’t represent my convictions or my temperament anymore. I’d say the revised edition is actually a new book. You might want to check my essay “The Process of Change,” published in AmSat News, where I explain the book’s transformation. What advice would you give to other Alexander Teachers to stay inspired and excited about their teaching? Lessons are actually encounters in disguise—encounters with the “other,” who really is a mirror for you to learn about yourself; encounters with the unpredictable, the challenging, the entertaining. Years ago I actually stopped thinking of myself as a teacher, with the duties and constraints that the word implies. Now I think of myself as an informal researcher in the field of creativity and health; my students really are my partners and assistants, each bringing completely individual contributions to my explorations. It makes for a very gratifying professional life! More information about Pedro de Alcantara can be found at his website. Space is limited for both events, so be sure to register in advance to guarantee your place. by Helen Farmer When I moved to New York after completing my MFA in acting I bought several books that claimed to be New York actor survival guides how to build your career, how to audition etc. I quickly realized little information that help me in the way I needed. I was tense, unsure, and had no idea how to make use of my training when I was sitting in a casting office or worse, waiting for the phone to ring. I wish I had been able to carry Bill Connington’s "Physical Expression on Stage and Screen" with me then. For, Mr. Connington has written a book that both educates and inspires. Working through this book an actor will not only find their feet on the ground and their head moving forward and up, but they will reignite their creative fires and empowered to be the artist they want to be. A true ‘survival guide’ if there ever was one. Mr. Connington begins as many Alexander teachers do with the story of F.M. the way he tells sets tone for the book to follow. He is not interested in being mired in the past. He touches briefly on the history of AT as well as his own experiences. These sections serve to contextualize the work, making it more someone who has never heard of Alexander or this kind of work. But this is a book for actors, not necessarily Alexander practitioners Mr. Connington moves quickly into the heart of the matter. With the suggestion that the results he has seen are: “Unique, surprising and unexpected” from an approach described as “organic, non-judgmental and open”, I would defy an actor struggling with any kind of block in their creativity to not dive right into the this book. In the early chapters Mr. Conninton begins to explore some basic Alexander concepts such as proprioception, end-gaining and startle response. Each explanation if followed by a clearly laid out experiential exercise that the actor can do on their own or with a friend. These exercises allow concepts to become integrated into the actor’s process. Being able to fully blend the Alexander technique into the daytoday lives of the actors and have it be relevant is clearly important to Mr. Connington and is manifested in several interesting ways. The most striking being the of the Alexander principles: Sensory Awareness, Inhibition, Direction, and Constructive Conscious Control. Instead Mr. Connington gives us: Sense, Poise, Flow and Choice. Reading this language I felt as if someone had opened a window in a musty room and let a little light in. The principles are all present, but the shift to less arcane language encourages a kind of accessibility I really responded to. The classical Alexander ‘directions’, become ‘flow thoughts’ and are dropped into the subsequent exercises that investigate both everyday (sitting, talking on the phone, typing) and more expansive activities (walking and talking, balancing, stillness), as well as breathing. Mr. Connington describes this work as: “a multi-platform self-improvement program” and through these exercises he offers concise, simple ways for the actor to gain more self-knowledge and freedom in their work. Had the book stopped there it would be an excellent introduction to Alexander technique, but it is the second and third sections that truly set this book apart for an actor. In the second section Mr. Connington asks the actor to come out and play or as he puts it: “stimulate and develop your imagination and emotion.” While never losing sight of the principles, the second series of exercises gives the performer the opportunity to explore character building, vocalization and movement in an enjoyable non-judgmental way. Mr. Connington asks the reader to do everything from chanting, to creating a silent movie, to reciting Emily Dickinson. Drawing on such influences as Michael Chekov and Stanislavski, Mr. Connington clearly demonstrates through this expansive and fun section that the Alexander technique is not a stand-alone aspect of theatrical training, and can be used to broaden the range of an actor’s work. In the third section Mr. Connington gets down to the nitty-gritty, how an actor is going to use the Alexander technique outside of the studio. This is an essential and oft-missed element of actor training; how do you take the creative exploration of rehearsal or class and put it to work in an audition or performance? Mr. Connington’s vast experience as an actor and working with actors is clear here. Using the Alexander principles he offers exercises that an actor can use in the mundane everyday work of being an actor. Exercises that will get one comfortable with a cold reading (essential if you want to audition for film and TV), or will warm up you up in three minutes or less (great if you are running audition to audition), or will allow you to let go and get some sleep at the end of the day (in case you ever want to play Hamlet). Moreover, he introduces the concept of constructive conscious control, or as he calls it ‘choice’ and offers it to his reader as the ultimate gift. As an actor it is easy to feel like you are not the one in control of your destiny. To be reminded that everything is a choice and that the ability to change lies within their grasp is a very empowering message and one every artist should hear. It is that message of empowerment I take away from this book. Mr. Connington is offering to every actor a simple, concise, and fun way to fully realize their potential as artists and as healthy happy human beings, an incredible gift to say the least.